A composite image of four NAV/CAM images taken 19 miles (31 kilometers) from the center of comet 67P/Churyumov-Gerasimenko. A new study has revealed that electrons from the comet, not photons from the sun, are responsible for the breakup of water and carbon dioxide molecules. Electrons cause the rapid breakup of water and carbon dioxide molecules erupting from the surface of comet 67P/Churyumov-Gerasimenko, new findings reveal. The discovery, which was made using NASA's Alice instrument aboard the European Space Agency's Rosetta spacecraft, was surprising to scientists, who had previously thought that light particles, or photons, from the sun caused these eruptions. As a comet travels closer to the sun in its orbit around the star, heat melts the rock and ice to create the familiar tail that streams from its nucleus. 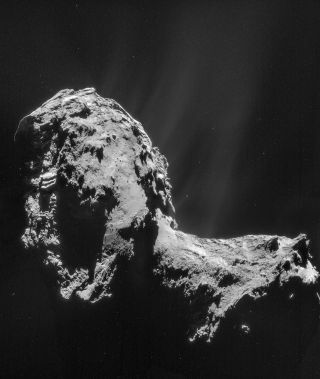 But the heat also causes plumes of water and carbon dioxide gas to erupt from the surface of the comet. Since last August, Rosetta has orbited within 100 miles (160 kilometers) of comet 67P, allowing the Alice instrument to study the comet and its plumes in ultraviolet light. To better understand these plumes, the Alice team studied the emission of hydrogen and oxygen atoms that formed as water molecules broke, as well as carbon atoms from destroyed carbon dioxide molecules. They found that the molecules were broken up in a two-step process. Rosetta's close study of comet 67P revealed an unexpected process at work close to the comet nucleus that causes the rapid breakup of water and carbon dioxide molecules. First, an ultraviolet photon from the sun hits a water molecule in the comet's coma, or atmosphere, knocking an electron free. The electron then hits another water molecule in the coma, breaking it completely apart into two hydrogen atoms and one oxygen atom, energizing them in the process. The energized atoms emit ultraviolet light that Alice detects. Sometimes, the electron collides with a carbon dioxide molecule, resulting in the breakup into carbon atoms and resulting carbon emission. "Analysis of the relative intensities of observed atomic emissions allows us to determine that we are directly observing the 'parent' molecules that are being broken up by electrons in the immediate vicinity, about 1 kilometer, of the comet's nucleus where they are being produced," Paul Feldman, a researcher at Johns Hopkins University and lead author of the paper describing the new findings, said in the same statement. The team compared the breakup of the molecules to the process proposed for the plumes spotted on Jupiter's icy moon Europa. However, the electrons of the comet are produced by solar photons, whereas the electrons on Europa come from Jupiter's magnetic field. Alice's far-ultraviolet spectrum allowed the scientists to trace the structure and location of the plumes on comet 67P, surpassing what can be done from Earth or Earth orbit. Observatories such as the Hubble Space Telescope can only spot the atomic constituents of comets after their parent molecule — the water or carbon dioxide — has already been broken apart. "These early results from Alice demonstrate how important it is to study a comet at different wavelengths and with different techniques, in order to probe various aspects of the comet's environment," said Matt Taylor, ESA's Rosetta project scientist. "We're actively watching how the comet evolves as it moves closer to the sun along its orbit towards perihelion [point nearest to the sun] in August, seeing how the plumes become more active due to solar heating and studying the effects of the comet's interaction with the solar wind." The results have been accepted for publication in the journal Astronomy and Astrophysics.